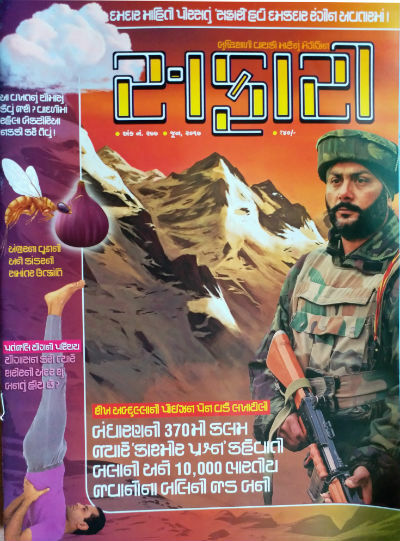 Like every month we were curious to explore this month’s issue of Safari Magazine (Gujarati edition). June 2017 issue of Safari is special as entire issue is published on color pages! It is worth to note that printing entire issue in color (on eco-friendly pages) cost additional 12 Rs. to the publishers, however, they have increased the price of the magazine by Rs. 5 only. The magazine talks about many things including the Kashmir issue. How the actions of Sheikh Abdullah resulted into a problem which is responsible for taking thousands of innocent lives over the decades, and yet, showing no signals of getting resolved. A soldier on the cover page with the title of mentioned article occupies most of the cover page. It gives the magazine a look of some no-nonsense magazine, which Safari is. So in terms of the cover page, the issue scores a point. Editorial of this month mainly talks about how the long awaited transformation of Safari (to became a magazine fully printed in color, and on rather glossy pages) took place. Sage Patanjali holds a special place in the heart and mind of all those who loves to take care of their own health, especially through Yoga. It was Patanjali who have documented Yoga by classifying it in various segments. The most popular segment of Yoga is Yogasanas. There is a dedicated article about “Patanjali Yoga” (formed as an answer to the question of the month) which talks about many helpful yogasanas, how to do them and what health benefits can be expected from it. The article is written nicely and studded with some good images also. At the end of the article, you will thank that it could have better if talks about more asanas have been covered. Actually, Harshal Publications should publish a dedicated book on Yoga, based on their research work and presentation skills, it would be liked by the readers without a doubt. What resulted into present Kashmir issue? You may feel that in Safari the articles about Indian history, Kashmir issue and India’s relationships with it’s neighbor nations are published regularly! One, however, needs to understand the importance of the stuff from India’s context. And most importantly, we mostly find biased and cooked up stories about important incidents from history which shaped the present and will affect the future as well. So someone should take initiative to talk about the stuff in a neutral manner and analyze the stuff objectively. Safari magazine does it. The editorial team digs history to find authentic evidence and seek the truth. And based on the facts they represent objective analysis. In this issue, the themed article (about Kashmir issue) talks about many aspects including >Sheikh Abdullah whose thinking and acts have left their impact on the situation in Kashmir. The article talks about Maharaja Hari Singh of Kashmir (obviously), Pt. Nehru’s actions, Sardar Patel’s actions and other stuffs as well. The article is backed with the facts and represents the problem in an unbiased manner. It is definitely one of the reasons to read June 2017 issue of Safari. This article is about various species which are dependent on each other for survival and existence. The article refers Charles Darwin and his magnum opus Origin of Species. Mainly written for nature lovers who are interested in interesting facts about various species and natural elements, this article is appealing to other readers also. Ravindra Acharya gave this article an interesting title, and those who are familiar with Gujarati literature will relate it to a well known Gujarati book. Written in interesting style this article talks about the inter-dependency of species like Fig and Fig Wasp, Orchid and Hawk Moth and other examples, though it is focused on co-existence of Fig and Fig Wasp mainly. The article provides a good reading experience, the pictures included makes it even more interesting and easy to understand. At the end of the article, you will be amazed by the way nature treats all its elements and provide them a fair chance of survival and existence. How effective this monsoon will be? Written by D. N. Kaushik, an article about Monsoon looks at it from a different angle. The article starts with the mention of “the red rain happened in Kerala – India on Jul 25, 2001! This “red rain” was in talks and news for many days, of course, there were many rumors were there in all the buzz, but some scientists have tried finding the facts behind this incident. Ultimately, Godfrey Louis and Santosh Kumar from Kerala wrote their analysis and research report in a magazine named Astrophysics and Space Science, with a possible explanation of the incident. Though, as it happens with all new theories, many people including scholars have shown their dissatisfaction towards it. Here is a quick link for those who want to explore more about it. The new angle of the existence of some bacteria and their impact on the clouds and thus the monsoon is quite interesting to explore. A worth to read article, especially when the monsoon is approaching India. How much amount of grains, vegetable and fruits is wasted in India on an avverage, per year? Which birds and animals enjoy their sleep in standing position? Why? How history is presented in Pakistan school syllabus? When a computer or smartphone or tablet is hanged, how come it start function normally upon restart? Why the rainbow is of half circle shape? In addition, there are other regular segments exploring interesting facts, making the magazine issue more valuable. It is definitely “worth the money and time” magazine issue. We recommend reading such knowledge magazines from the market which is flooded with many not-so-worth magazines. And yes, we love the colorful version of it :).